With an average marathon of 5:10 and bike split of 6:41, Ironman St. George 2011 is at the top of RunTri's Toughest/Easiest Ironman list. 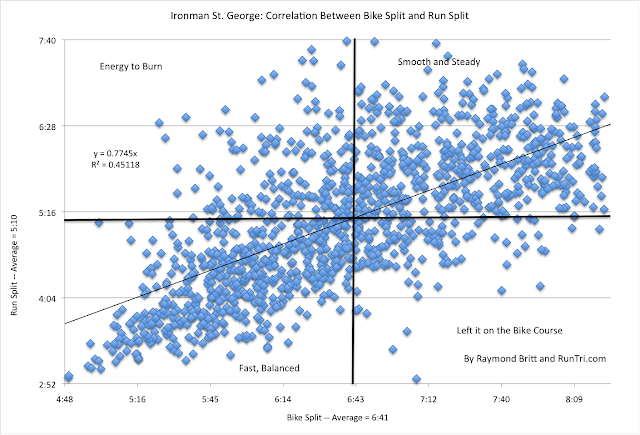 When it comes to balancing the bike (x, and 50% of total race time) and run (y = 77% of x), our analysis of IM StG 2011 highlights four groups: 1. Fast and Balanced; 2. Energy to Spare for a fast run; 3. Left it on the Bike Course; 4. Smooth and Steady for a slow bike and slow run. You want to be #1 or #4. In comparison to similar analyses of other Ironman races, the finishers at Ironman St. George seem to have struck a clear, if conservative balance between bike and run. Translation: it appears fewer blew up on the run after riding too hard on the bike course. As the R^2 is .45, the correlation is low overall, but in an Ironman, all that really matters is reaching the finish line. For more see Ironman St. George and RunTri's Race Analysis Index.